MANNY: Gui, how are you doing today? GUI: I’m doing awesome Manny, how is your day going so far? MANNY: My day is fantastic as always. Sales were a little bit low the last couple of days – probably because of Valentines Weekend, there was spring break and I did a price change on something I probably shouldn’t have done during this period. GUI: So you’re saying you have bad sales for March 28 due to Valentines, which is on February 14? MANNY: I meant Easter! For those of you who are new listeners – our Q&A’s always start with a personal question that I have for Gui. It’s always a serious question… Gui, if I got a really bad haircut that I’m really proud of, would you tell me straight how bad it is? GUI: I would not only be straight with you but I would make fun of you from a place of love. MANNY: We’re being straight always…with each other and with our listeners, so that’s cool. Let’s get to our first Q&A question for the day. GUI: Before we start – since you cannot speak today, let me make sure… today it’s Thursday, right? Not wine Friday. For those of you who don’t know – on weekends Manny takes a few glasses of wine and the lips get looser on the periscopes, a few golden nuggets are shared there! MANNY: Question number one! Hit me with it. MANNY: That’s a great question! 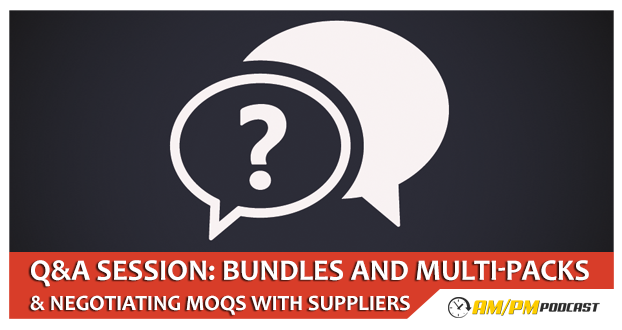 Actually it’s not bundling – if you’re putting two of the same products together, it’s called multi-pack. Your cost is going to be pretty low, let’s say $3 per unit, so for an extra $3 per unit, you can add another $12 to the price point. You need to do a couple of things when you’re doing this. First thing: I’m assuming you’re going to put everything into a poly bag, so the bag has to be a specific thickness (it’s on Amazon, it can’t be a thin bag). Second thing: because you have two products in there, you’re going to want to add a ‘do not separate’ label to it. I have fluorescent pink ones, which I have the supplier print and stick on. You’re using suffocating material so you need to have a suffocation label on it, which Amazon requires after a certain size. GUI: If the opening of the bag is over 5 inches. MANNY: You’re going to need a new ASIN as this is a new product. The last thing I can think of is that you’re going to need a three-foot drop test once it is all in to ensure that the products don’t fly out when you drop them from three-foot high. GUI: It seems like a lot of work but it’s just a matter of giving all specs to the supplier. Just tell the supplier what you need and they’ll give you a quote for it. MANNY: If you’re dealing with factories or manufacturers in China, just let them do everything so you’re doing it all at once, which will cut cost. It might be 10 or 15 cents to do the whole thing. For those of you who are new – I suggest to sell products for $30 and the reason for this is the product price from suppliers normally where the selling price is that high, is more expensive so less competitors are going to be able to compete with you. It’s much easier for someone with a limited budget to start out with products of a much lower cost. Gui, I’ve got another question for you. What is the time limit on a fortune cookie and how do you know this? GUI: That one’s easy – 23 hours and 47 seconds. It’s general knowledge! MANNY: You’ve got to do it right away! Alright, go ahead. MANNY: MOQ is minimum order quantity. That is the minimum amount that the client has to order for the supplier to do business with them. If you have $9000 to start, and you can get 1000 units, that’s great! If you have done your research and you have a good product, you should feel comfortable that you will move those units. If they don’t do that well, you can sell them at cost. To get it reduced – if you didn’t use the contact template that was included in EP8, they won’t treat you as a professional buyer. You contact them through Alibaba so whatever e-mail address you use will show, if you use a Gmail address and you’re contacting them it doesn’t look that professional. Pay $10 for a domain name to get you going. When they see that the email comes from a company domain name, there’s a little added value to you being their client. If you use the template, it says that you’re essentially checking the orders out and not directly asking them to reduce their MOQ. Later on you are going to order larger amounts. You’ll want to have a single page website with the e-mail as they’ll check that. If they’re still not budging, look for a different supplier. Don’t be forced to do business with one supplier. Try to find a different product if they’re the only supplier. GUI: In order for it to be a good deal, it has to be a win-win. If it’s not a win-win, then you’re not going to be happy with their transaction and have a good feeling going into this business as it is probably going to be a long-term relationship. MANNY: If you like this episode, leave us a review on iTunes. Follow us on Periscope – @mannycoats. GUI: Don’t miss working out the Friday scopes. 5:36 Should I bundle products to increase product margins? How can I create multipacks on Amazon? 11:56 How can I get my suppliers to sell me less than their MOQ?